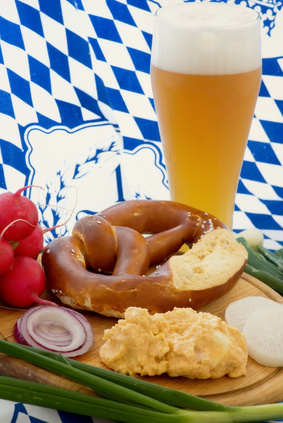 Most bavarian beergardens and restaurants have this Camembert spread/dip on their menu also called "angemachter Camembert". Great as appetizer or in between meals enjoyed with a cold Hefeweizen. It's usually served on a Whole Grain or Rye Bread or personal favorite a fresh, warm Brezel. Garnish Obazta with thinly sliced red onion rings and lettuce. Some recipes call for a mixture of 1/2 Camembert and 1/2 Brie cheeses. All Ingredients should be at room temperature. Cut Camembert and Brie in small cubes, add the cream cheese and mash with a fork until both cheeses are combined well. Add butter gradually until desired consistency is reached as well as the seasonings, combine everything well. Cut the peeled onions in fine cubes and add to the cheeses, add the beer at the end and combine everything by mixing one more time. 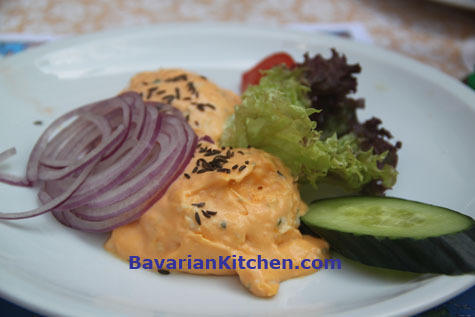 Scoop the Obazta on a plate or dish, spinkle more red paprika and cumin on top and garnish with red onion slices. Serve with fresh Rye or Whole Grain bread or a Bavarian Brezel. Obazta at Hofbräuhaus in Munich, Germany (August 2011).